The 16 songs cover: verbs, nouns, sentences, pronouns, compound personal pronouns, adjectives, adverbs, apostrophes, prepositions, direct objects, capitalization, plurals, irregular verbs, commas, quotation marks and Greek & Latin prefixes and suffixes. The lyrics really educate... the real appeal of Grammar Songs is the idea of inculcating so many concepts effortlessly through song. I teach Grammar Workshops to about 60 students who will become teachers and I would like to make 'Grammar Songs' a requirement for them. Thanks. 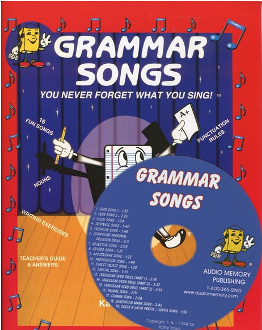 I instructed my daughter in grammar with 'Grammar Songs' and a 4th grade A Beka grammar worktext. She memorized most of the songs and completed the exercises. After one year she progressed from a 5th grade to a 10th grade level on the California Achievement Test.